The Accessibility Tree is a subset of the DOM, that mirrors each element included in the DOM, but strips out the unneeded parts which wouldn’t be beneficial for assistive technologies. In short, this is what is presented to assistive technologies who want to digest and interact with a web page. It is important to understand that how each browser builds its DOM and Accessibility Tree will be different. Also their support for newer markup such as HTML5 and WAI-ARIA might be limited. That is why it is important to test what you plan to implement with various browsers and assistive tech. Understanding the DOM and Accessibility Tree doesn’t really matter, but being able to identify why something may, or may not be picked by assistive tech does. Using CSS we can hide an element from the page using either display: none;, or visibility: hidden;. Although other methods of hiding elements with CSS exist, both of the above CSS properties are most commonly used. They have one common problem: both are completely ignored by assistive technologies! Now the fact that they are ignored is not a bad thing, but it does lead to misuse, which in turn creates accessibility problems. So let’s look at some examples of where it could go wrong. JD Sports have many flaws with their website, but let’s only consider their search field for now. Example of a labelless search input field, used on the JD Sports website. Labelless search fields are quite common these days. They can impact accessibility in a few ways, but let’s just consider one: a field without a label. Now for assistive technology this creates a problem as the field will make no sense. For most it will simply be interpreted as an edit field. So to counter this we would add a label for the input field, to explain its purpose to assistive technology. 1. They correctly create a label for the input field, but don’t relate it to the field by using the label for attribute. 2. The input field for the search field also doesn’t have an ID attribute to map the label for to. 3. The final nail in the coffin though, and the one that we care about most in the context of this discussion, is their use of display: none on the search label. I see this a lot! It drives me nutz, because knowingly, or not it defeats the purpose of the accessibility feature they have attempted to add. Of course though, not everyone understands that display: none;, or visibility: hidden; are ignored by assistive tech. In the case of JD Sports though, however had built their site is clearly a bit of a cowboy, who doesn’t really know what they’re doing. So if you can’t hide it with display: none, or visibility: hidden then what do you do? Ok simple stuff, right? So what if we go for something a little bigger, like a navigation menu? On the Poundland website, and countless others, they use display:none; to hide the contents of the drop down navigation menus until they are selected. Makes sense you would think. Let’s also assume that your dropdown navigation menu is keyboard accessible. It would still make sense, because when the user focuses on the top level navigation item, the child elements we assume will become unhidden? Wrong! We can’t predict that all users will interact with a web page in the same way. Keyboard navigation may be one choice – another option though might be to scan the page line by line with assistive tech, or use keyboard shortcuts to get where you want in a document before scanning its contents. This scenario wouldn’t work, as the child navigation items would be hidden from assistive techs view, so they would only pick up on the top level navigation items, not the hidden contents. Example of Poundland hiding content from users of assistive tech, with display:none;. Now hiding content off screen for accessibility purposes is all good, but couldn’t that be abused to improve search engine rankings? Of course it could, but thankfully search engines are clever enough to know when someone is abusing this or not. Keyword spamming off screen might downgrade your ranking, and if bad enough remove you from search listings altogether, but providing accessible information and links will not. Google Webmaster Tools, have an article explaining this in their help sections, titled: Hidden text and links. So when does it make sense to use display: none;, or visibility: hidden;? The Scottish Government has an odd example which admittedly isn’t fully accessible in its current implementation, but makes a good use case for using display:none; (and it does). Scottish goverment website example of using display:none;. Play around with the Scottish Government example and see if you can spot their accessibility mistakes with this cookie control. There is also a blatant lie in regards to cookies. See if you can spot it. No prizes, but I’m keen to see if anyone can spot the mistakes. Using what you’ve learned so far you should be able to. A checkout process might be another example of when it might make sense to use display: none;. You might require data to be entered into the current step, before being able to progress to the next. So if you didn’t use display:none; here, then you might confuse users of assistive tech who would be able to read steps that visual users can’t, for good reason. VoiceOver by Apple has accessibility issues when an element’s height or width is set to zero. An element with this style applied will be ignored. Enrique Palazzo as far as I can tell was the first person to identify this issue on a Drupal issue ticket. Kent County Council at the time of writing introduce this issue for VoiceOver users on their off screen skip links. Example of Kent councils websites, impacting Voiceover users, with a height and width of zero. It is easily fixed though by increasing the width and height to 1px. While we are on the topic of faulty skip links, the UK Government’s Digital Service website hide their skip link with display:none;. Interesting when it is supposed to be a pioneer for government digital content. Example of the UK goverments Digital Service website, hiding their skip link with display:none;. So using CSS to hide elements from the page isn’t a terrible thing to do in regards to accessibility. The main problem is the misuse of it, and being able to understand when it should, or shouldn’t be used. Each of these adds display:none; inline to the element, which depending upon the context of its usage, could present accessibility issues. So when using any of these methods, like in our previous CSS examples, it would only makes sense to use them, if the context of there useage doesn’t impact accessibility. The problem with both, is that they don’t interact with the DOM. As such elements added via these methods most likely will be ignored by all assistive tech. So avoid these like the plague! Build a bear is one of my daughters favourite shops. They commit a double crime, with their flash not enabled warning. Firstly they exclude it from assistive tech as the write() method isn’t interacting with the DOM. Next they write in an image, with no alternative description. So they may as well display nothing, for all the use it provides to assistive technologies. 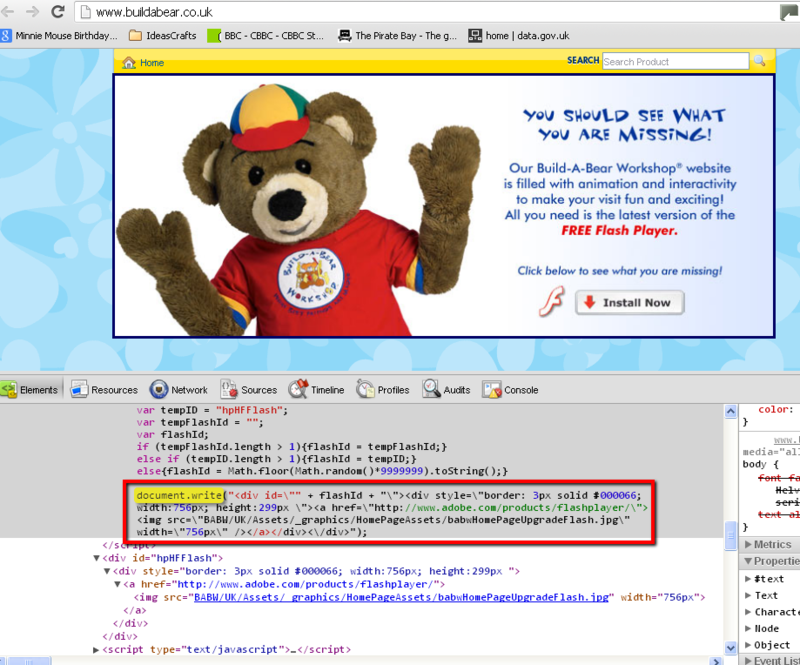 Example of the Build a bear websites, no flash warning. There is a couple of attributes in HTML that can hide content from assistive tech. The first is the input element’s type attribute. If the value of its attribute is set to hidden then obviously the field will be hidden from view. Assistive tech treats it exactly the same by ignoring it. It is actually quite a common technique, that is used on most websites, to store values. Back in the days of caveman development, when entire websites used to be constructed of forms to control layout, you could often see username and passwords being submitted in hidden fields as a form of access control. Thankfully those days are long gone. So this technique isn’t so bad, depending upon how you use it. It’s pretty hard to mess this one up. As a general rule of thumb if an image adds descriptive value to the context of a page, then add alternative text for it using the alt attribute. If it is purely for decoration, add the alt attribute but leave it empty. The above randompicture.png image if used purely for decorative purposes, would correctly have a null alt attribute value. Many assistive technologies will choose to ignore the element completely, as with an empty alt description, they assume it is for decorative purposes. You might also add an image on a button with the type image, or a link anchor with an image inside it. In the above example you might confuse the need for adding alt text if the image overlaps the anchors link description. As the anchor already has a link description “Register” adding the alt of “Register” again would merely duplicate the content. For most assistive tech, duplicate content would be read twice, sometimes without any context, e.g. image alt: register, register link, might simply be processed as register, register link. So it’s worthwhile noting that alt attributes with a empty value will be ignored by assistive technologies. Let’s not talk another further about the specifics of alt attributes and how to use them correctly, because that is a topic for another time, and already covered in great detail all over the web. HTML5 brought us a new attribute called hidden, which when used hides the element it has been applied to from view. As far as I could tell, all current browsers that support this attribute, simply apply a style of display:none; to the element. So effectively when used this will be ignored by screen readers, so use with care. As we have already discussed with the CSS technique, sometimes it is useful to use display:none; and other times it can impact accessibility. Currently the way that browsers are treating this attribute, by applying a style of display:none; to it, for me seems pointless. CSS was of course created for this purpose: controlling presentation of the page. So I would argue that creating an attribute to control something that is already done via CSS, is pointless. At least now it can be used by assistive technologies in conjunction with aria-hidden to provide content for assistive technologies. Currently though what it does, is completely redundant. Of course though, we could just live with it and think semantically that yes, perhaps hidden is indeed hidden, and as such display:none; would make sense. You can flip a coin both ways I guess, so who am I to argue? 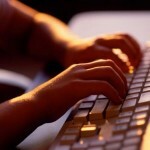 WAI-ARIA introduces a couple of ways to hide content from assistive technologies. Sometimes it might make sense to hide visual content from assistive technologies. To do this we make use of the aria-hidden attribute. If you are displaying duplicate content because it fits with the design, rather than having the content interpreted twice by a users of assistive tech, you can hide the most sensible instance using aria-hidden. In the above example HTML it might even make sense to use aria-hidden to make sure decorative images are not read out by assistive technology. Although some assistive tech will ignore images with empty alt tags, not all will, so doubling up with aria-hidden=”true” helps our chances. I say chance, because support in both assistive technologies and browsers is a bit lacking. The presentation role, is used to convey that an element is used for presentational purposes only. As such, these elements would provide no benefit to users of assistive technologies and should therefore be ignored. Again using the same example as used in the aria-hidden example, specifying an element with the presentation role, further increases our chances of it being ignored by assistive tech, but still having it remain visually on screen. 3. A layout table and/or any of its associated rows, cells, etc. So useful, but again lacking real support from browsers and assistive technologies. So I hope you are now more aware of how elements can be intentionally, or unintentionally hidden from assistive technologies. There is a lot to consider, but the most important aspect, is to consider the context of the element/container in question before deciding if the technique is correct, or not. Thanks Phil, glad you enjoy it! what you mean is that HTML elements marrked up with that CSS property are ignored by ATs. Not that the ATs ignore the CSS rules. Sorry, I just found that a bit confusing sometimes. Fair point David, my bad for assuming people would take that as a given. 1. The style or properties might or might not be reflected correctly, depending upon how the browser in use decides to map the property placed in the DOM, to its accessibility tree. 2. Platform accessible API’s then interact with the DOM (which in turn (exposes its accessibility tree). Again, the API in use might, or might not support what you are trying to expose to the assistive technology. 3. Depending on the assistive technology in use, it may or may not support what you are trying to do. Or if it does, as is also the case for 1-2, it might try and do something different with it. 4. Going way back we didn’t even use APIs in assistive technologies, everything was done using heuristics to determine elements intended functions. Just image how much fun that must have been to work with! To some extents, assistive technologies still make use of heuristics these days. There’s not a lot out there about HTML5 multimedia accessibility. Thanks David, I haven’t had much exposure to the HTML5 video tag yet, so that was really useful. Darren; you have a little typing error in the section about the presentation role. It shows a mythical role=”decoration” instead of role=”presentation”. I expect that you were thinking of the name of the image in your example! Thanks for letting me know, now amended.